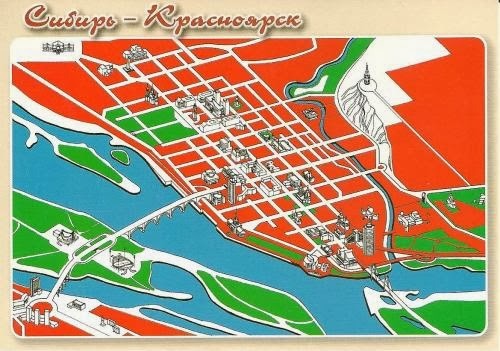 Postcard RU-2308129, sent on the New Year's Day from Russia, shows a map of Krasnoyarsk, the third largest city in Siberia, Russia, after Novosibirsk and Omsk. It had a population of almost 1 million in 2010. Located on the Yenisei River. it is an important junction of the Trans-Siberian Railway that connects Moscow with the Russian Far East and the Sea of Japan, with branch lines going into Mongolia, China and North Korea.